This blog is written by Liz Spinks. 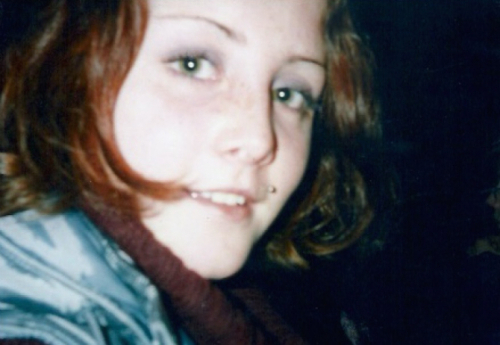 My daughter, Lorna Spinks, was born on 23rd October 1981 and died on 7th May 2001 – 48 hours after swallowing one ecstasy tablet whilst out clubbing with friends from University. She was born in Geneva and spent her too brief, but happy life living in France, attending a French primary school, then International School of Geneva, where she obtained her IB before going on to University in the UK. Lorna was an incredible young woman; optimistic, a wonderful friend to her peers, a very caring sister to her older brother and her and I had a very close relationship. Unfortunately her father and I separated just 6 months before Lorna died, however I don’t think that contributed to what happened. She adored life, was adored by her friends and was extremely happy at Uni. She’d also just met a new boyfriend who she thought I might approve of for a change. On that fateful day she went clubbing with 15 of her uni friends – they thought they’d have a better time if they took a wee pill. In the club Lorna started making no sense, she collapsed and her friends realized what had happened. She was taken, unconscious, to Addenbrooks Hospital, where the staff tried very hard to stop the inevitable and were perplexed by what the tablet was doing to her body. One organ after another shut down until her last breath, 48 hours after she’d been admitted – I was by her side the whole time. My heart was broken forever that day and many more besides, including her brother and close friends. Luckily, her friends were fine – they all came to her funeral in France, which was attended by 200 people. As I recall, the student who sold the drugs got a one year prison sentence. I did not attend the trial because I could not face seeing him. At the time I so wanted her death not to be completely in vain, so my brother and I did an awareness campaign on very large billboards all over London, as well as TV interviews etc. I also did some talks at her school where I worked. I know for a fact that we did reach some kids. We received so many messages from young people, which made me happy as I know that’s what Lorna would have wanted. However as we know, 14 years later, young people are still dying and NOTHING has changed to try to stop these deaths. My daughter was a perfectly normal, intelligent, loved teenager who may have still been alive today had the government moved the drugs discussion into the 21st century. I support the work of Anyone’s Child: Families for Safer Drug Control – and sincerely hope that someone in Westminster will move this debate forward quickly, in order to stop more beautiful young people dying unnecessarily. 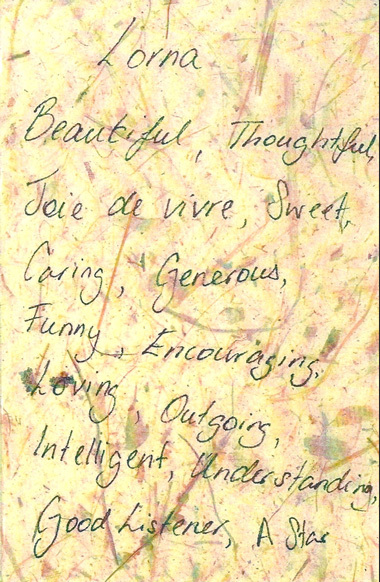 This note was left on Lorna’s grave. I do not know who wrote it …. Well done Liz. Great to see you supporting this cause again. Thank you for your courage and good sense. Thinking of you today. I left that note all those years ago.